Stagecoach bus inspectors given bravery award Two Stagecoach bus inspectors have been honoured by the Royal Humane Society (RHS) for their role in helping to save lives when Workington’s Northside Bridge collapsed during the Cumbrian floods of 2009. As reported exclusively in CBW at the time, Kevin Sheehan and David Hoare were at the Northside Bridge in November 2009, when severe flooding caused the bridge to collapse into the River Derwent. Prior to its collapse, both men helped prevent people from crossing the bridge by standing at each end and turning traffic away. 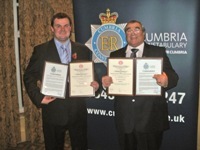 In honour of their bravery and selflessness during the incident, both men were given the RHS Award and the Chief Constable’s Award at a ceremony attended by the High Sheriff of Cumbria and Craig Mackey, Chief Constable, at the Roundthorn Country House Hotel, Penrith, Cumbria on Thursday, November 10. The RHS is a charity which grants awards for acts of bravery in the saving of human life and for the restoration of life by resuscitation.